Spectacular, trumpet-shaped, salmon-red flowers from August to September and dark green leaves. 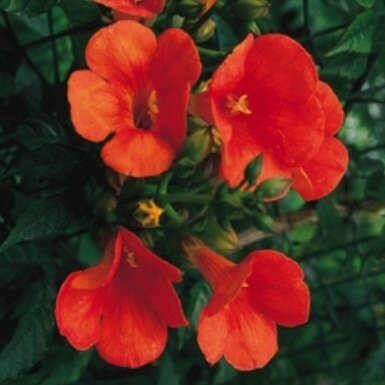 This vigorous orange-red climber looks great trained over a sunny wall or fence. Until the plant has fully established, the shoots need to be trained and tied to a trellis or framework of horizontal wires. Supplied in approx 3-4 litre containers, at around 80-120cms tall - flowering sized plants.